New season mistletoe looking good. Lots of berries – again… We seem to have several good berry seasons in a row. This year they’re even turning white early – with some almost fully white (though not yet translucent) already. That fits with other fruiting trends this season – many other plants’ fruits and berries ripened early too. 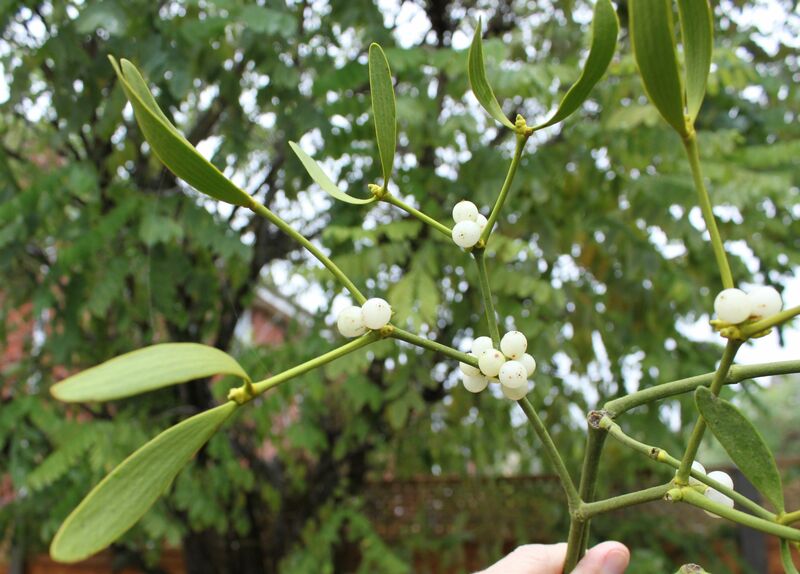 The mistletoe berries aren’t all green though – plants still in shade still have solidly green berries. 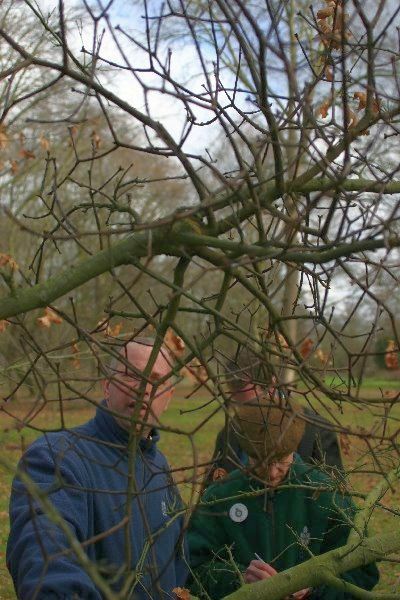 Our biggest garden mistletoe is one of those, and is steadfastly refusing to turn white – yet. But the shade is rapidly vanishing, as host tree leaf-fall has accelerated in the last week and is exposing more and more mistletoe. The deciduous mistletoe Loranthus europeaus, native to central southern Europe. Not obvious in winter! That sudden ‘exposure’ at this time of year is one of our mistletoe’s distinctive features – contributing to its role in legend and tradition as a symbol of ongoing life. The tree may look ‘dead’ as it loses more and more leaves, but the evergreen mistletoe, newly exposed, represents ongoing green life. The paperback of Kate Mosse’s Mistletoe Bride book. But what is the green gunk on the branch? …the paperback edition of Kate Mosse’s The Mistletoe Bride and Other Haunting Tales . I’ve chosen it not because it’s particularly mistletoey (it isn’t, apart from the title story, and that’s not, really, very mistleotoey). Its place here is really because the cover design earns the first mistletoe graphic thumbs-down of the season. Whatever is that green stuff on that branch? If it’s supposed to be mistletoe the artist (and the art commissioning editor at Orion) have clearly never seen, or even bothered to look up, mistletoe. It looks like some sort of creeper, a day or so after herbicide treatment. It’s so unlike mistletoe it’s a strong contender for the Naff Depiction of Mistletoe Award for 2014. But nominations are still open, so worse may yet appear. Oh no, it’s mistletoe season again! Mistletoe season is looming ever larger. Again. And despite it happening this time every year, I do feel it’s taken me a little by surprise this season. Lots still to do and to plan. Including reporting on current mistletoe matters here. 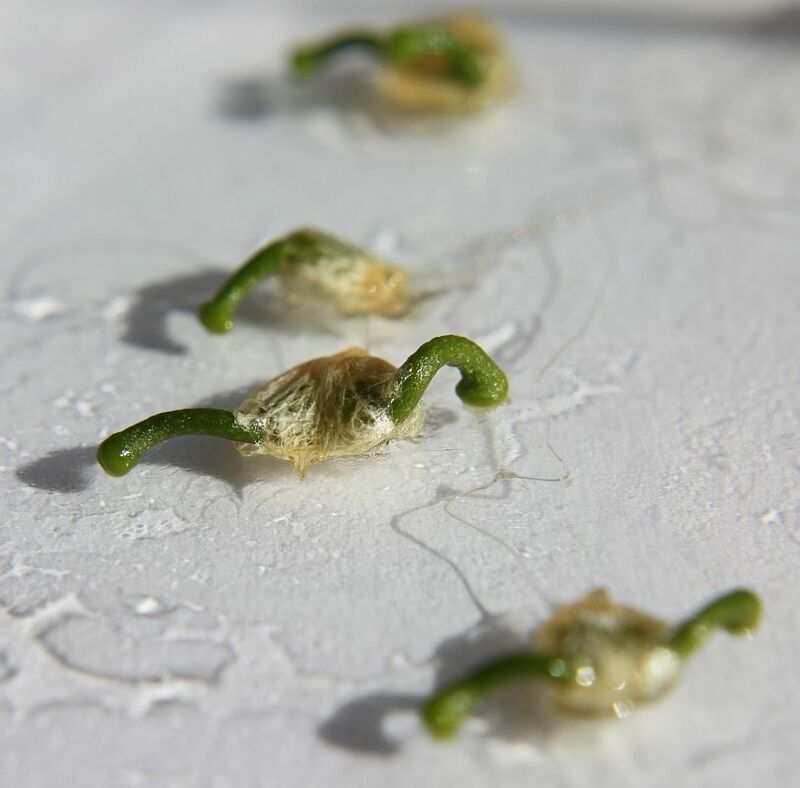 discuss seedling survival – how long can a mistletoe seedling survive without connecting to the host? And lots of other mistletoey stuff, as it arises. All of it, obviously, presented in the best possible taste (I’ll keep the references to the ‘sperm of the gods’ to a minimum). That’s all for now – I’ll be back blogging properly from next week. The English Mistletoe Shop is open again this season, though this year we are concentrating more on grow-kits rather than mistletoe itself. There’ll be more news on that soon.